Having a new Smart Meter installed is something which most customers only experience once. This topic shows what the process involves and highlights particular issues with the newer SMETS2 meters which OVO started installing widely in March 2019. You must be present for a Smart Meter installation. 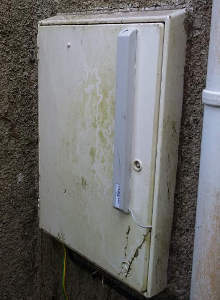 The Engineer needs access to the house, even if both gas and electricity meters are in external enclosures. There is an initial survey of the state of gas appliances and your electric consumer unit. Photographs are taken and any gas boiler is turned off. The electricity meter is usually changed first. The Installer is permitted to snip the seal on the main fuse and can reseal it without needing to call your Distributed Network Operator (DNO). Here my SMETS2 meter is indicated with a red arrow. This one is made by a US Company called Aclara. It has two buttons marked A & B rather than the keypad of the earlier SMETS1 meters, which were manufactured by Secure. Above the meter itself there is a communications module (blue arrow) which allows data transfer via the mobile phone network. There are several versions. As I'm in a rural area of Devon with relatively poor signals, this Toshiba unit is a Mesh Network device. It connects to an external aerial via the wire marked with a green arrow. The aerial is the tall rectangular box which is literally stuck onto the outside of the door. Your gas meter may be in a wall mounted enclosure, or buried in a "semi-concealed" box as is mine. 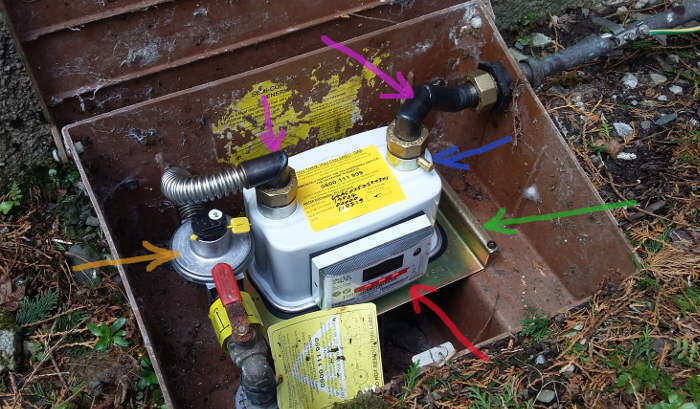 The Installer first removes the old meter including the round regulator (orange arrow), and then screws a steel mounting frame in place, shown here with a green arrow. The meter may seem a relatively large device, but it's actually two items. 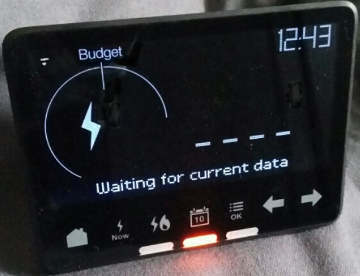 The actual SMETS2 Smart Meter is indicated with the red arrow, and slots into the larger outer body. My new gas meter is manufactured by Uniflo. Because there is no electricity available, it contains an inbuilt Lithium battery which should last around 10 years. 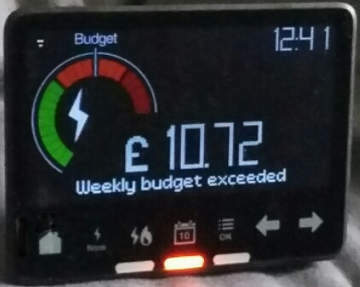 A Gas Smart Meter spends most of its time in sleep-mode to conserve power, waking up every few seconds to send a signal to the SMETS2 electricity meter. OVO have designed and fabricated right-angled steel pipes marked here with purple arrows. These minimise the height required and allow the enclosure lid to properly close. During the commissioning process, the installer connects a manometer to the test point identified with the blue arrow. The gas pressure pushes the fluid up one side of the u-shaped tube. If it remains steady over a two-minute timed period, then there are no leaks. The Installation Engineer will now take another set of photographs which get inserted into relevant places in the electronic "form" on his mobile phone. There is a minimum set of 23 pictures which must accompany any installation. As the exact installation process may evolve over time, please note that these SMETS2 meters were installed on 11th March 2019. Once your new SMETS2 meters are physically installed, the commissioning process can start. 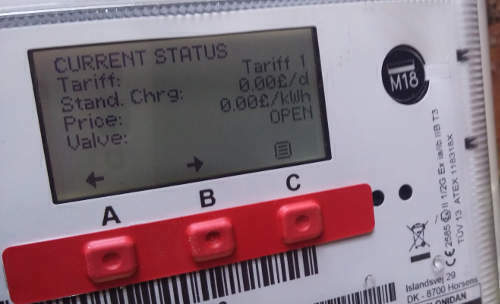 The Engineer will use a proprietary App to connect the electricity meter to DCC, the government-owned Data Communications Company. Theoretically this should simply involve taking a photo of the bar codes on the meter. However, the two installations I've seen thus far both involved entering the meter numbers into the App manually. There are different serial numbers for the electricity Smart Meter and its communications system. And there is plenty of room for error, such as confusing an 8 with a B. The App is clearly not yet fit for purpose and needs additional features to be added. 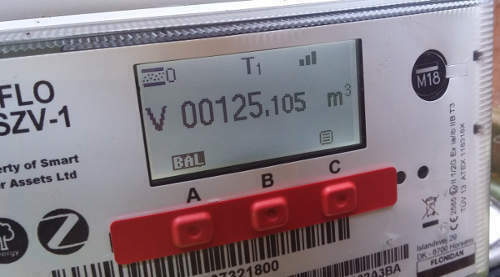 Once the Engineer receives confirmation that the electricity meter and DCC are communicating correctly, the new SMETS2 Gas Meter is paired with it. This uses a wireless signal running at 2.4GHz called Zigbee. The electricity meter is the master unit. It is the only item with a connection to the outside world, shown as a red wireless signal in the above diagram. Finally, the In Home Device is unpacked and paired with the electricity meter. The Installer will run through the basic features, which are described more fully in a small instruction book. OVO are currently installing an IHD called a Chameleon. It also uses the Zigbee wireless protocols. This local Zigbee system can in future be extended to control other smart devices such as washing machines or storage radiators. It's called the HAN (Home Area Network). Initially, the IHD may not show any data at all. 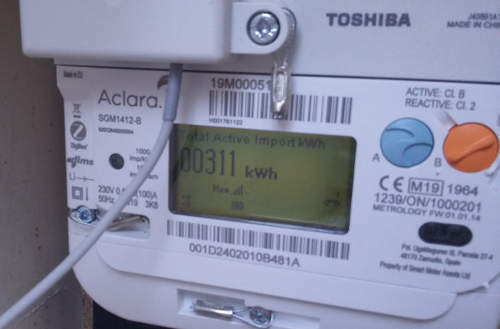 You can be assured it is communicating with the electricity meter, however, because there is a white signal-strength meter at top-left of the display. ... but the figures bore little resemblance to the actual energy used. This is all quite normal. There is a lot of work which continues in the background once the on-site installation is complete. Not only will DCC be testing and tuning the encrypted communication links, but OVO will be installing your actual tariff data. This is held in the master electricity meter and is only required for you to view readings on the IHD. The actual usage figures are calculated separately by OVO as part of their billing process. It can take several weeks before the entire process is completed. Only then will your IHD reflect the same information visible on your My OVO page online. If there are any discrepancies in billed usage in the meantime, these will get automatically corrected because the actual meter readings are cumulative. One issue which might occur when you have a Smart Meter installed is poor WiFi performance. Sometimes it can fail altogether. WiFi can operate in two frequency bands. The earlier standard, still most commonly used, is called IEEE 802.11b and runs at 2.4GHz. The same frequency is used for other wireless domestic products such as door-bells and some remote controls. However, the software protocols for all these devices is different, which is why there is little perceptible interference when two or more are operating simultaneously. 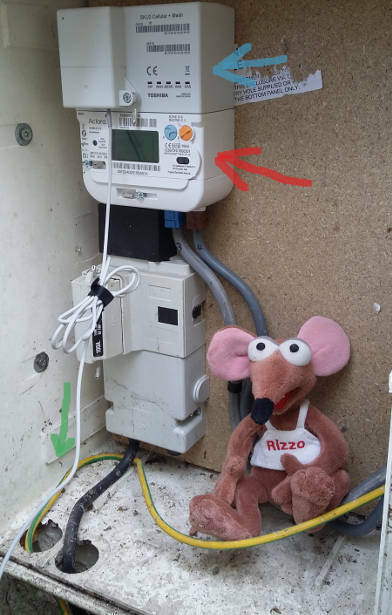 The Zigbee network which connects your Smart Meters and your IHD is another 2.4GHz standard, properly referred to as IEEE 802.15.4. Unlike doorbells and remote control units, both WiFi and Zigbee are continuously live. Whether they clash or not depends on the channel number which each one uses. In the UK, WiFi is assigned 11 overlapping channels. 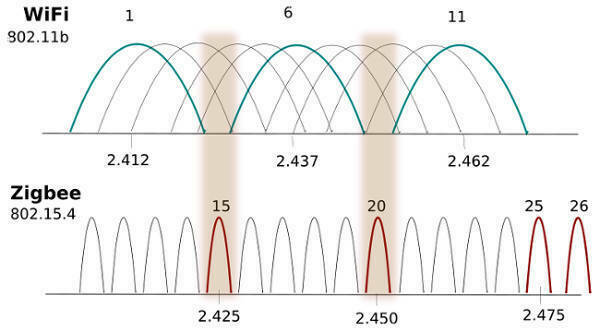 In order to avoid degradation of the signal, we normally employ one of channels 1, 6 or 11 because these have no overlap. You can select this manually by logging into your router. Zigbee has 16 channels, which carry much less data and can therefore be non-overlapping. 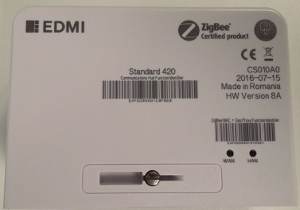 In the USA there is a convention that any new Zigbee device will be configured to use either channel 15 or 20. These have frequencies which neatly sit in-between the commonly-used WiFi channels. In the UK there is no such convention, and it's possible that a Zigbee device could use any of the allocated channels. So if your router happens to be sited close to your new SMETS Meter, there is the opportunity for interference to occur. All is not lost however. Firstly, you could login to your WiFi router and change the channel it uses. Failing that, Zigbee itself has an inbuilt Channel Agility. Once it recognises that its frequency has a sufficient level of interference that data is being lost or corrupted, then it will switch to an alternative channel. This process isn't immediate. Both of your SMETS Meters and the IHD will all be using the Channel Agility protocol to find a common channel which suffers least interference. It might take an hour or so before everything gets sorted. In the meantime, don't switch off your WiFi router because this will halt the automatic Agility process. When the router is next re-powered, the interference will start all over again! Note that there is nothing which OVO's Installation Engineer can do about such problems beyond noting on the job-sheet that WiFi was lost when the Smart Meters were powered up. Zigbee self-allocates channels (eventually) and the Installation App doesn't have a facility for manual channel selection. Nor are Installers trained or permitted to start logging into your router and manually changing its channel. And you should have it password protected anyway! 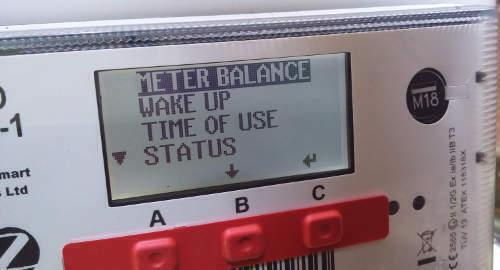 When Smart Meters get installed at a property for the first time, your account goes onto billing suspension until everything is validated behind the scenes. Direct Debits will continue to be taken, and you won't be able to request that OVO refund any of the amount by which you are in credit until the next full Statement has been issued. This process is only partly within OVO's control. They don't "own" either the new Smart Meters, nor the original ones which were replaced. 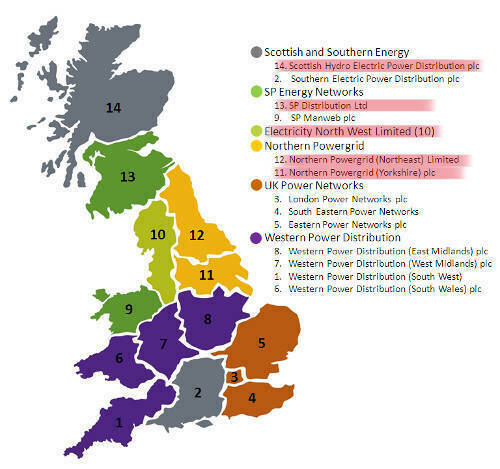 The UK's central meter databases are ECOES (electricity) and Xoserve (gas). It is they who receive the data regarding the meters which have been discontinued. They serve Notifications on OVO which include the final meter readings. Each Notification includes a delay period, during which an objection must be raised if the Meter Reference Number, house address or readings don't tally. It isn't possible for OVO to issue any Bill or Statement during this process. So - when will my Mk1 meter be swapped with an industry compatible MkII meter? A single Data Communications Company (DCC) has been set up to handle the commands and data flowing within the British Smart Meter Network. (Northern Ireland doesn't have Smart Meters governed by this legislation). The first generation of SMETS1 meters were connected by using the existing mobile phone network. 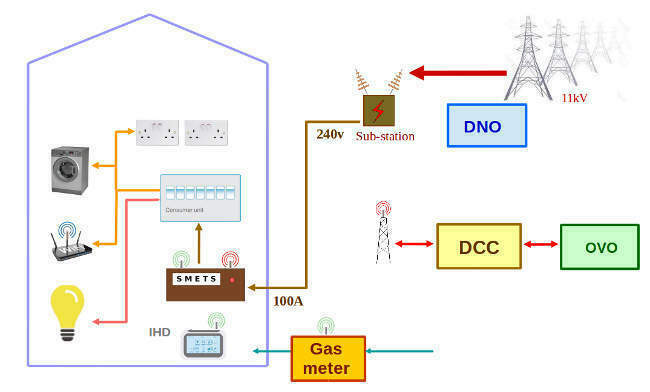 DCC then designed its own Smart Meter Network which would take over the data-flow when it was complete. The original projection was for 5.4 million SMETS1 meters to be installed by then. Delays have meant that an additional 7.1 million SMETS1 meters were installed onto the pre-existing mobile phone network. The intention now is to migrate all of those 12.5 million onto DCC's Smart Network during 2019. The Smart Network was put out to tender and contracts awarded in September 2013. Southern and Central England, together with Wales, was won by Telefonica (who own O2). The North and Scotland was awarded to Arqiva who are installing 700 new masts to support a long-range radio network... a contract worth £625m. The territories are defined along the same geographical boundaries as those used for the electricity Distributed Network Operators (DNOs). I have highlighted the Northern Territory (Arqiva) in red because, at the time of writing (March 2019) this part of the Smart Meter Network is not operational. That means no SMETS2 meters can be installed there beyond the 3000 which already exist. In the South and Central Territories, Telefonica have enhanced their existing O2 GSM (mobile phone) network to provide SMETS2 coverage in areas of higher population density. This is supplemented by a Mesh Network serving regions more sparsely populated. 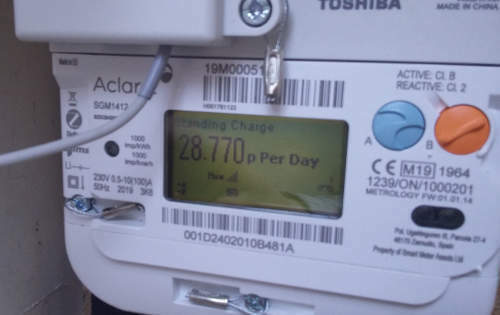 Whether you are in a territory served by Arqiva or Telefonica, your Smart Meter is connected to DCC using an encrypted protocol audited by GCHQ. 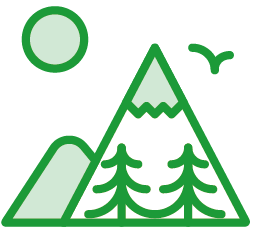 There is no direct link between your Smart Meters and OVO or any other Energy Supplier. Hi @chrisjw37 I can't directly answer your question because I know neither where you live, nor whether yours is a Secure Smart Meter, installed by OVO. In most cases it will not be necessary to replace the meter itself. SMETS2 is a defined set of software protocols. So existing SMETS1 meters merely need to be upgraded. OVO have announced that they will be doing this across the Smart Meter Network without an engineer needing to attend on site. Both Telefonica and Arqiva have signed contracts which require their networks to support software upgrades and patches to the meters. However, this is quite a tricky operation to undertake. The engineers must be certain that a poor communications link isn't going to leave a meter in an inoperable state, whereby no electricity or gas can be delivered to the home. I realise a meter can be upgraded, but when? We have 4G and 3G signals. There are three phases of SMETS1 upgrades planned. The first starts at the end of May 2019, the second at the end of Sept, and the third has no time-frame announced as yet. I don't know which phase you will be in, @chrisjw37 . The Energy Suppliers are invited to propose to DCC a number of their customers for each phase. This list is then modified according to technical parameters. It doesn't matter what level of mobile phone signal your area has. This was only relevant in the last four years prior to DCC's own Smart Meter Network going "live". Energy Suppliers negotiated their own data pathways which were based on the 3G GSM network. That's why SMETS1 meters didn't enjoy interoperability between Suppliers. The actual amount of data needing to be transferred to/fro a Smart Meter is very small. Within DCC's new Smart Meter Network, geographical coverage and resilience are more important than speed of communications. The lower the radio frequency, the less data it can carry, but the better is its penetration into buildings. Telefonica (South & Central territories) will continue to use the O2 3G-network with modifications, augmented by Mesh technology, which can link house-house across large rural areas. This is called a Neighbourhood Area Network (NAN). In the North of England and Scotland, Arqiva are implementing a new network using FlexNet technology by Sensus in the former terrestrial television 400MHz band, with EDMI providing the meters. Spiffing stuff, basically like Brexit, no real end date at all. What's the problem in the north? Hi @Somerpark - Arqiva aren't making use of the existing mobile phone communications, so they have much more work to do than Telefonica. In order to hit the target of the %age of properties which must have SMETS2 functionality, Arqiva are using dedicated radio telecommunications at 400MHz, which they call Flexnet. It's the same system they're employing for Smart Water Metering in the Thames Water area, where leakage is a massive problem. I don't know whether the delays with deploying SMETS2 coverage in the Northern Territory are due to technical problems with Flexnet or simply the fact that they have to physically install 700 new masts. Their territory is not only larger than either the Southern or Central areas, but also has a significantly lower population density. Using 400MHz not only gives them communications over large distances, but also better wall penetration to reach meters in older stone buildings. "Arqiva is a leading provider of smart metering communications infrastructure. 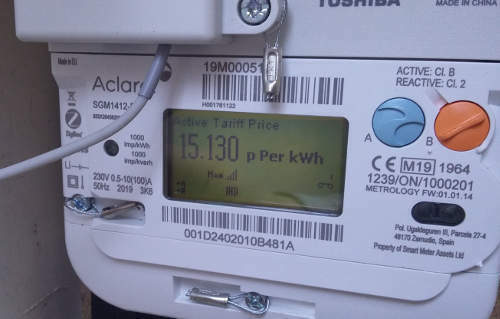 It has long term contracts with customers including the Data Communications Company (the ‘DCC’, a body licensed by statute and backed by the utility companies) and Thames Water, plus a trial with Anglian Water to provide fixed network infrastructure to support smart metering roll-out. In November 2016, the communications network provided by Arqiva as part of a 15-year contract with DCC, covering the North of England and Scotland, went live. Consequently, revenue streams from this contract increased in the period. Following ‘go-live’ further service roll-out will continue and accelerate." If they went live two years ago their continued roll-out should be pretty well advanced by now! In a financial report last year they claimed to have met their contractual obligations with 88% coverage, some way short of the easy 99% they were claiming after trials in 2013. But none of the above explains why the northern roll-out has been stopped? I'm puzzled about the date you've found in Arqiva's press release, @Somerpark . I assume the trials in 2013 were part of an appraisal in order to be granted the DCC Network Contract for the Northern Territory. We can actually read those contracts because they're posted online here and they date from 2013. There are 3000 SMETS2 meters already live in the Northern Territory. So this suggests that a technical problem has arisen which curtails the programme to add more. Perhaps the problem isn't actually within Arqiva's control or contractual remit. Let's remember that the Communications Modules which attach to the SMETS2 Electricity Meters are supplied by another company. And, of course, the data passes out of Arqiva's network and into equipment run by CGI IT UK Ltd. Either of these could be holding up the meter roll-out. There are occasions when it might be necessary to provide a manual reading of a SMETS2 electricity meter. The Aclara meter has just two buttons marked A and B. Everything you're ever likely to need can be done by pressing button A. By default the LCD screen displays the cumulative usage in kWh. Press A once and the screen back-light comes on to make it easier to read. That's the reading you would submit to OVO if they requested it. The meter will continue to count the total usage even if the communications links went down. Since my SMETS2 meters were only installed three weeks ago, the picture above doesn't actually show the correct figure for my contract. However, the dummy figure enables the Engineer to demonstrate the workings of the IHD, which is an essential part of the installation process. This too is a dummy/default figure. It can take around 5 weeks before OVO programs the meter with the actual tariff rates. It is unlikely you will ever need to press button B. It shows the current date & time, provides technical information and has a sub-menu for engineering use only, which is protected with a 4-digit PIN. My SMETS2 gas meter is in a semi-concealed box. It's still possible to read the display because the steel mounting frame holds the meter at the rear of the enclosure and as high as it can, whilst still allowing the lid to close. The meter has three red buttons, marked A, B, and C. To conserve battery, the LCD screen is normally blank. Pressing either A or B displays the amount of gas used in cubic metres. If you are required to provide OVO with a manual reading, you would submit the five large figures before the decimal point (00125 in the above example). The bars at top-right show the strength of the wireless connection to the (master) SMETS2 electricity meter. Pressing button A again will display the amount of credit balance in £s if the meter is configured to operate for a Pay-As-You-Go customer. For those readers who are technically-minded, this display shows me the Firmware version of the SMETS2 software and the version of the base operating system on which it runs. 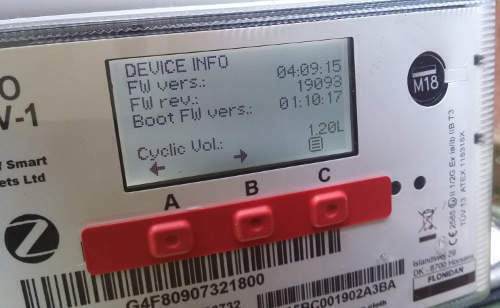 For those reading this description at a later date, please note that this Uniflo meter was installed in March 2019. Unlike my electricity meter, there was no dummy/default reading held in the gas meter at installation time. Since the tariff details are all zeros I can't see any gas usage on my IHD at the moment. Downloading my actual tariff data into the SMETS2 meters is almost the final step in the weeks-long commissioning process. If you want to know a bit more about this SMETS2 gas meter, there is a PDF of the UK version which can be downloaded from the Danish manufacturer's website. It is not unusual to smell gas close to where a Smart Meter has just been installed. The Engineer will have allowed a certain amount to escape when air was purged from the new meter. You are more likely to smell gas if the meter is in a semi-concealed enclosure below ground level. Some gas components (Methane) are lighter than air and will have drifted away. Others (Butane and Propane) are heavier than air and will stay at the bottom of the meter box. The smell isn't a natural constituent of mains domestic gas. The odour is a chemical added to natural gas and is chosen to quickly alert your brain that something is wrong. When I took the pictures above, it was almost 3 weeks after my new SMETS2 meters had been fitted. So I was somewhat surprised to still smell gas when I opened the lid to view the meter display screen. If this was due to a minor leak, I reasoned that it was most likely to be on the input side of the meter. The Installer had used a manometer on the output side as one of the final checks. So any leak on my side of the meter would have been revealed by the pressure dropping and the liquid-level falling in the u-tube. As I do my own plumbing, I already had a bottle of gas-leak detector spray available. I squirted it liberally around all joints and watched for bubbles to appear. There were none. Having convinced myself that there was not a leak, I left the enclosure lid open for an hour to let the wind blow fresh air around. Then I closed it again. Four hours later, I returned and opened the lid once more. As expected, the smell of gas was significantly reduced. So what would I have done if there really had been a leak? There's a help-page on gas-leaks on OVO's main website which is worth reading before you ever have to deal with a potential leak! The one thing you must never do is to grab a spanner and attempt to tighten any joints around your gas meter. No one is permitted to work on gas pipes unless they are Gas-Safe registered. 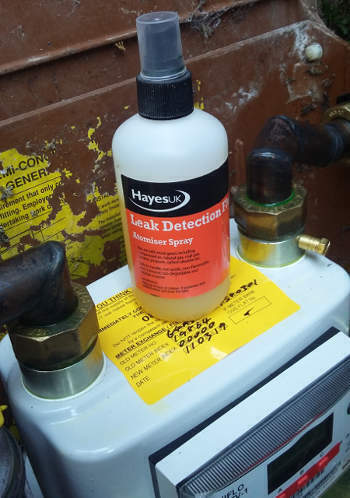 And finally, if you want to buy yourself a bottle of special Gas Leak Detector fluid, then you can get it at B&Q, Amazon, ebay and most plumbing suppliers for around £6. Do not use other bubble-solutions, like washing-up liquid, because residues can cause corrosion... which is never a good idea! I believe I messed up my dates, the tests were in 2010 but I was reading those reports and the 2013 contract reports at the same time also the 88% coverage was a 2017 report read in 2018. I think on rereading my original post I was in as my wife would tell me "grumpy old man mode" and I was trying to shoot the messenger (sorry). You are the only source I can find to date saying the rollout in the north has been stopped, though a late March a Bulb blog is admitting to issues with installations in the north and a concentration at the moment more on the Central & South areas. My grumpy thoughts were - here I am in the north 400m from two mobile masts with 3 bar indoor coverage on at least 3 if not 4 mobile networks and I'm stuck with a radio network which apparently doesn't work. So a little more reading in a calmer state of mind. Arqiva 2018 full year report states a coverage of 97.75% and helping Telefonica meet its minimum 95% indoor coverage in their areas. I also agree that other parts of the system may well be responsible . The CGI IT Uk Ltd equipment is possible, but is the data they get from the Arqiva radio network dramatically different from the Telefonica network data once the transition method is removed? The communication module is more likely, it is a single option from one company in the north while there are two companies and about five variants in the south. While Arqiva can claim 97.75% transmission coverage (downstream) they have no control over the strength of the upstream transmission from the communications modules which is likely to be much weaker, and as they say it takes two to tango. Or am I in grumpy mode and just looking for someone to blame? The other thought is why is this such a secret? Other than yourself and the afore mentioned Bulb blog there is nothing in the media, that I can find, about this problem. You would have thought that with all the delays with SMETS2 and the £11Billion cost the media would have picked this up and be having a field day at the governments expense. I would like to say thanks for this thread. It provides a very detailed explanation and timeline on how an installation should proceed. There is very little information like this out there. A little surprised at the commissioning time but good to know if the north ever gets its act together. I think you're heading in the right direction, @Somerpark. I believe that the difficulties in rolling out further SMETS2 meters in Arqiva's Northern Territory is most likely down to problems with the new Communications Module not reliably connecting with their radio network. Energy suppliers can currently only install SMETS2 meters in at most 70% of all households due to limitations in the technology currently available to them. [....] Installation of SMETS2 meters in the North of England and Scotland is also lagging behind the rest of Great Britain due to problems integrating smart meters with communications infrastructure. Whilst this narrows down where the main difficulty lies, it doesn't place the blame anywhere. After all, there may be several companies who are supplying the Communications Hubs which get bolted on top of the SMETS2 electricity meters. Since there are only 700 masts to cover a territory which stretches from the northern islands of Scotland right down to a line which runs from Manchester to Scarborough, I think there is very little correlation with the position of existing GSM mobile phone masts. So I'm afraid the signal strength on your mobile phone isn't going to provide us with much indication of the 400MHz network coverage. ... and I've just been trawling through a large number of documents released by DCC about the differing types of SMETS2 meters which are permitted on their shiny new network. So at least you can now see what you can't yet have installed! This is such a useful thread!! Yes a very useful thread . I have been wondering for some time when my first generation Ovo smart meter would be replaced/upgraded. I am at TQ3 2SX, ie South Devon. When is it likely my meter will be upgraded remotely or replaced with a SMETS2 meter? This test appears, on my reading of it, to only have tested the transmission in one direction from mast to receiver and not from the receiver ( comms module) to the mast. The only test done at that end was to compare the attenuation of the signal from inside a building with that of an external signal equidistant to the measuring equipment. The test area in Altrincham appears to be about 1 mile by 1 mile, which is about the effective range of a 1 watt output Walkie Talkie, with its external antenna, in an built up area, maybe. The lack of information on testing the upload path seems careless. Perhaps it was done but the problems with connectivity in the north suggest otherwise, and that the output power of the comms module may need to be increased. One of the problems I have when reading reports posted by the likes of Ofgem and DCC is that there may be later updates which I haven't (yet) found. Although the test you refer to was valid at that time, it may be superseded by further studies. Frustratingly, there is no Revision History system which refers back to earlier documents. It's rather like constructing a Family Tree where we can see Birth Certificates and Census Records, but there are no Marriage Certificates. So I don't want to jump to any assumptions that there wasn't a later series of tests on the upload links at 400MHz. My next observation is that EDMI are a highly reputable company with vast experience in designing Smart Metering across all sorts of wireless networks. Their products have a worldwide installation base. They are exactly the sort of company to whom you would expect DCC to award a contract. The Electricity Smart Meter specification requires it to be capable of delivering 12v at 500mA to the Communications Hub. Optionally there can be an AC (240v) connector if they wish to have their own power supply within the Comms Hub. Since EDMI manufacture both the Smart Meter and the Comms Hub for Arqiva's Territory, this is completely within their control. So if the EDMI 420 Hub is using only 1W of the available 6w for radio transmission, then there is probably a good reason for this. I doubt that the rest of the electronics in the Comms Hub requires more than 3W including the Zigbee HAN. If I was looking for a possible constraint, I think I'd start by investigating EMI (electromagnetic interference) and legislation about transmitter power in close proximity to humans or other equipment. In 2016, previous generation electric and gas "smart" meters were installed at my address. In 2017, I changed provider to OVO. The existing "smart" meters were not compatible with OVO so became "dumb" meters. In Sept 2018, OVO replaced the old "smart" (now "dumb") meters with new "smarter" meters - these each have a keypad and LCD panel. It turns out the gas meter has been non-communicado since day one so, in effect, has been operating as a "dumb" meter. Now OVO are rolling out a newer generation of meters - let's call them "smarterer" meters. So, at some point in the not-too-distant future, these "smarterer" meters will be installed at my address? I am in the London area, by the way. Not counting the old original meters, this will be 3 different sets of meters in less than 5 years. Multiplied across the country, how much is this madness costing?